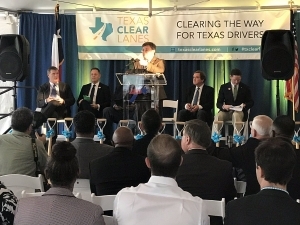 DALLAS (WBAP/KLIF News) – Ground was officially broken on a much anticipated road expansion in Dallas Wednesday afternoon. TXDOT’s Tony Hartzel said “The Southern Gateway Project” is a $666 million project aimed to rebuild and widen Interstate-35E south of Downtown as well as widen U.S. 67 between I-35 and I-20, and the I-35/67 split. “This corridor is more than 50 years old. So it was time to do something. We need to add capacity,” he said. Hartzell said the purpose of the 11-mile project is to improve safety and provide congestion relief. “People need to be prepared to be alert. Sign up for traffic alerts because it’s going to be a lot of work going on in a short amount of time,” he said. The work is expected to jam up traffic during North Texan’s morning commute, Hartzell said all lane closures will happen during overnight shifts. The City of Dallas also plans to add a deck park over the interstate. The project could take up to four years to finish.